For many students, one of the hardest parts of writing is trying to come up with what to write. Boring book reports…meh. Boring book reports...meh. But if you assign your students to write a book review over a well-loved, compelling, inspiring book... this sounds like a lot more fun. Much less painful... and sometimes your student may actually become so engrossed in what he is writing about he forgets that he doesn't like to write! But if you assign your students to write a book review over a well-loved, compelling, inspiring book… this sounds like a lot more fun. Much less painful… and sometimes your student may actually become so engrossed in what he is writing about he forgets that he doesn’t like to write! Writing a book review over a favorite book is something your students might actually enjoy. We spent time daily reading aloud as well as reading individually. If you love books as we do, your students probably have some favorite books they get excited just talking about. Our kids in their twenties/thirties still remember some of our favorite books! 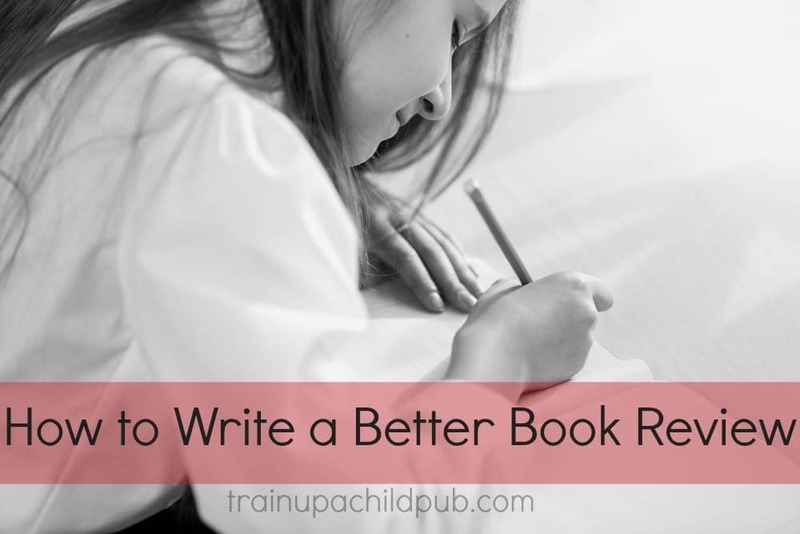 So the first part of how to write a better book review is choosing a well-loved, exciting book. The second part is to write it for the purpose of getting someone else to read it. Since that’s what we naturally WANT to do after we read a great book, this kind of book review is much easier to sell and much more fun to write. A third part of this assignment is posting the review on Amazon.com afterward! Who doesn’t want to see their work published?! This lesson today is taken from the Ancients unit of our Middle School-1 lesson plans but could be adapted for younger or older students. Describe the main problem (conflict) in the story. How did I change as a result of this story? What’s the main theme or message of this story? 3. In the following paragraph, your student should tell about his favorite parts of the book. A few incidents will be enough–caution him about writing down too many parts or going into too much detail here. 4. The last paragraph should include the main message of the book and should restate what the book meant to him or what he learned from reading it. Your student may want to add one final statement about why someone else would want to read this book. Don’t forget to remind your student that even professional writers have more than one draft, so he is likely to have that, too. If your student enjoys drawing or painting, encourage him to include an illustration with his review. If you are using these instructions with an older student, you could use this opportunity to teach/reteach the elements of literature such as plot, characterization, theme, setting, conflict, climax and resolution. Lengthen the number of paragraphs required according to the age and writing experience of your student. With just a few tweaks, you can make a normal dry book report into something much more fun to read and write! For more ideas about teaching writing, review our Reluctant Writer series.